Now the first two you are probably familiar with. You have brownouts regularly and have a hard time finding cheap, reliable, fast internet connections. For sure, those of us in the provinces deal with horrid reliability and service for electricity and internet connections. And these two infrastructure components are often cited as reasons why businesses shy away from the Philippines. They can’t make money if they can’t operate, communicate or compete in a modern way. Number three, computers in education, is one of those commitments to raising the competitiveness of Filipino kids that the Department of Education (DepEd) just cannot wrap its brains around. Kids are still packing ratty old text books in the rain while other nations are plugging students into the cloud. That leads to number 4, problem solving, which DepEd and a whole lot of people simply don’t seem to do rigorously. That is evident in the enduring problems we face and lack of depth within the economy. The Philippines primarily does manufacturing by instruction, making component parts for other companies, much akin to painting by the numbers or kids learning to memorize rather than understand. The Philippines to my knowledge does very little primary manufacturing for the global marketplace and little research and development except in some agricultural areas like hybrid rice. The Philippines does have a leadership position in call center servicing and OFW’s as a commodity. The nation could also be making a run at global leadership for tourism and gambling, and it DOES have filmmakers and performing artists, I’ll give the Philippines that. It is not a vacuum after all. But this is not a complaint session. I have to set the scene, and the scene is not pretty. The economy is thin, the people are poor. In this article, I’ll address the first of the four component parts of infrastructure: electricity. Along the way, I’ll point to one energy area in which the Philippines COULD set out to lead the world. First, let’s look at two regulatory organizations within the Philippines. Electricity is the responsibility of the Department of Energy (DOE). The cabinet secretary in charge is Carlos Jericho L. Petilla, previously governor of Leyte. He was appointed to the DOE job by President Aquino in 2012. The DOE’s web site is elegantly complex and striving to be comprehensive. It still has some pages where there is little meat (Energy Reform Agenda, Energy Efficiency). At first I was confused by the site until I found what I wanted. Then it became very useful. Without question, Department of Energy is a huge bureaucracy. It is an employment factory. Mandate: The Department is mandated by RA 7638 (Department of Energy Act of 1992) to prepare, integrate, coordinate, supervise and control all plans, programs, projects and activities of the Government relative to energy exploration, development, utilization, distribution and conservation. Mission: We at the Department of Energy, in partnership with our stakeholders, shall improve the quality of life of the Filipino by formulating and implementing policies and programs to ensure sustainable, stable, secure, sufficient, and accessible energy. In pursuit of this mission, we commit to render efficient service with utmost integrity and professionalism. The expansiveness of DOE organization can be found in the link: What we do: Bureau & Services Functions. From there, you can click to more detail about each of 60 – yes, sixty – subordinate units. Given how many people work there, it is amazing that electricity is such a problem in the Philippines. What are they doing all day if they are not busy giving us electricity? There are apparent duplications, for example, two different geothermal units (“Geothermal Energy Management”, and “Geothermal and Coal Division”); why is that, one is inclined to wonder. One is planning, the other geo-resources I guess. Buried under the strange heading “Energy Situationer” are links to the 2012-2030 Philippine Energy Plan plan and the Executive Summary. Oddly, the plan is more generalized and presented in slide-show format, whereas the summary is a 12 page text recitation of priorities and statistics. But both documents are worth a look. Here are the major programs drawn from the Executive Summary. The charts shown in this article are representative of the plan itself. I’ve extracted a couple of paragraphs from the summary that seem particularly meaningful. A. Power Sector Development: More stability, fewer brownouts. The country’s peak demand for power will grow at an annual average rate of 4.3 percent over the planning period. The country will need about 13,166.7 MW of new capacities to meet domestic power requirement – energy demand and reserve margin. From the needed capacity, 1,766.7 MW will be provided by committed power projects, while the remaining 11,400 MW will be available for private sector investment. Of the 11,400 MW, 8,400 MW will be baseload plants, 2,100 MW mid-range plants, and 900 MW peaking plants. The investment requirement to pursue and undertake the sectoral targets for this plan update is estimated at Php 2.80 trillion. As such, the government must intensify its initiatives to promote and showcase the various energy investment opportunities with the private sector. Considering the vulnerability of the energy sector to conditions like extreme weather patterns, an energy sector-wide climate change adaptation strategy is envisioned to be put in place. Said framework aims to address the climate change impacts in energy systems, such as power transmission and distribution systems, fuel distribution and renewable energy systems. B. Fuelling Sustainable Transport Program: Switch public and private vehicles to clean fuels. C. Indigenous Energy Development Program: Tap the nation’s many energy resources at local levels. D. National Renewable Energy Plan: Developing non-fuel-burning energy resources: geothermal, hydro, wind, solar, biomass and ocean. The passage of Renewable Energy Act of 2008 strengthens the policy of the government to accelerate the exploration and development of RE resources in the country. With this, around 9,300 MW from indicative and potential RE resources (geothermal, hydro, wind, solar, biomass, and ocean) have been identified as aspirational target, which could be harnessed within the planning period. For LCS, RE will grow at an annual average of 3.2 percent and will contribute an average share of 37.0 percent to the total energy supply. Geothermal will grow at an average rate of 4.2 percent contributing an average share of 64.0 percent of total RE. Meanwhile, hydro will exhibit 3.5 percent average growth rate and with an average share of 15.0 percent (total RE) within the planning period. Biomass will demonstrate 11.2 percent average share of RE. However, biomass supply will be on a downward trend by the end of the planning period. Combined share of solar and wind will be almost 1.0 percent and will exhibit an annual average growth rate of 20.4 percent. E. Energy Efficiency and Conservation Program: new laws and new technologies. F. Natural Gas Masterplan: Build a natural gas infrastructure. I think this mammoth bureaucracy has outlined a good plan, and seems to understand the business of power generation. What is missing is the hard assessment of WHY the Philippines struggles so. There is no critique of the processes or laws or politics or environment that would allow the reader to gain any confidence that DOE knows what has to be done to break through the incessant problems and looming energy shortages. There seems to be no sense of urgency at all. No candid focus on what is broken. The Energy Regulatory Commission is the “policy and practices” organization that makes and enforces rules that fit the four main pieces of the energy business together. It issues licenses. I think it is failing, myself. Or else the failure is in a disconnect between this Commission and the DOE. Atty. Zenaida G. Cruz-Ducut is the Chairperson and CEO of the ERC. There are four other commissioners on the Board, with one position currently vacant. What I find missing is the same vacuum that exists in the DOE’s plan. Where is the recitation of the problem? Where is the forthright view that the ERC has failed to provide the nation with ample, cheap, reliable power, and the acknowledgement that businesses and consumers are suffering for the failing? Are they AFRAID to state the real problem? Or do they not even know what it is? What we get on the ERC’s web site are the usual self-congratulatory awards and braggadocio. And every transaction and regulatory decision known to Filipinos anywhere on the planet, as if an overwhelming swarm of activity could be construed as competence. I apologize, I do. I get worked up over some things. It seems to me that the power industry is a collusive mishmash of big companies that make money every which way but by competing. Their focus is not to beat the competition by providing good, cheap, reliable electricity. There is no competition. The companies are private. Each player receives a right to own a part of a very lucrative pie. The power companies thrive on shortages and problems because they can use them to mark up their rates. Indeed, generating companies have been accused of planning shortages by taking multiple generators off line at the same time for “maintenance” – to raise prices. The electricity organization in the Philippines looks a lot like the tangles of wires in Manila, including generating, transmission, distribution and supply companies or entities. 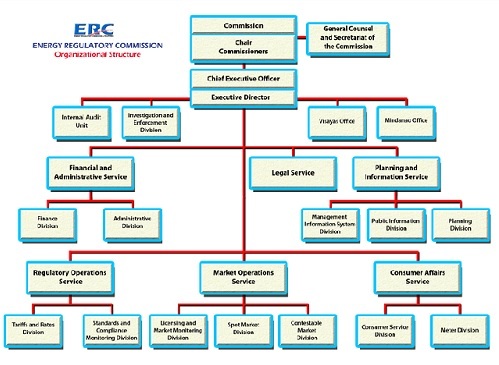 The ERC shall, in determining the existence of market power abuse or anti-competitive behavior, require from generation companies the submission of their financial statements. Well, what do you expect? The law was crafted in the House of Representatives, notorious for having lawmakers skilled at boxing and shoes. With friends in the energy business. And it was done in 2001 under the Loophole in Chief, President Gloria Arroyo. The energy regulators are obviously a few bulbs short of a chandelier when it comes to problem solving. The Philippines needs more electricity at cheaper rates but DOE and the ERC and their thousands of staff cannot . . . seem . . . to . . . do . . . that. Let me give you are real-life example of why. Take a look at the chart on the right. 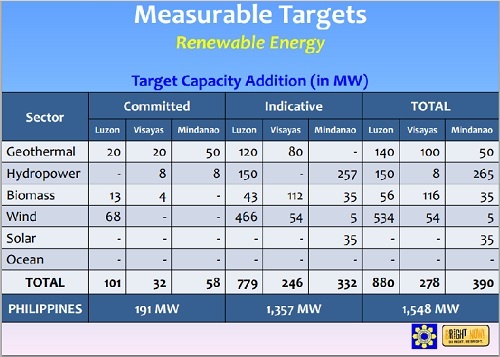 It is drawn from DOE’s plan and shows renewable energy targets. Look at the geothermal line for the Visayas. The expectation is that by 2030, the Visayas will generate 80 megawatts of electricity on top of the 20 megawatts now in the pipeline for a grand total of 100 megawatts. Here on Biliran we have a geothermal project underway in the test phase. It has proved to be the hottest in the Philippines. Estimates are that it can generate 120 megawatts of power. One project will bust right past DOE’s plan. Project operations are being run by a team out of Iceland, the thermal energy capital of the world. But the project is all knotted up in demands from local government. Build roads. Hire our people. Pay our fees. Send a couple of dozen of our people to Iceland to inspect your operations there. Pay some more of our fees. And the local workers on the project are sandbagging it to draw out their term of hire. These are barriers to smooth implementation. They represent costs that will be built into the project for its lifespan, if the project ever gets off the ground. The Icelanders are having trouble drilling test wells because the heat melts their pipes. Why is the ERC not on top of this situation? Or are they colluding with it? Why is the PHILIPPINES not the thermal energy capital of the world? Why are we blundering about in the bureaucratic forest? Why are we making it hard for businesses to succeed? Why is the ERC not all over the problems in Biliran, solving them and making things easy for the Icelanders? Achieving the goal for the Visayas with one project? Get that 120 megawatts on-line. It’s like gold, but the local claim jumpers are more interested in enriching themselves than achieving the nation’s critical need. (1) Fire some desk jockeys and get some people into the field. Help cure the problems in Biliran and elsewhere. (2) Establish a national thermal energy program, a National Thermal Energy Corporation, that stops looking at the problem as bits and pieces and sets out to tap hundreds of outlets across the nation. Become the thermal energy capital of the world. And get the self-serving people out of the way, those who are sucking the competence of the Philippines off into their bank accounts. You can be so good, at times! You thought you wrote a piece on Energy in the Philippines but actually you wrote a State of the Nation’s which fits all departments. That’s true, I suspect. Effort is divided into little details with hundreds of chiefs in conflict with no master plan aimed at large achievement that would align the vested interests toward the same target. That does seem to be the pattern. Roads, buildings, energy . . .
Again, a first read, Joe, a quick one at that, leaves me in total puzzlement, also with a good amount of despair. Many of the members of my graduating class belong to the upper echelons of academia, government and industry. I dare to say most if not all know the difference between static charts of organization and the dynamic real needs and demands of running corporation and country. Many of them made their professional marks outside of the Philippines and are still available to make a difference. The thing lacking is for them to be conscripted to serve their country. Many are retired and many are soon retirable. We had a prescriptive leadership and others that seem to be always on the make. So far to no avail. To make another metaphor, we have the arrowheads, the shafts, the feathers but no arrows nor the right archers. The targets have come and gone. There are more to come as surely as day and night. What a wonderful metaphor, all the pieces are there, but they never get put together. And sometimes politicians run off with the arrowheads. Thank goodness, I got a reprieve from Binay scandal and looney justice system dispensed by kindergartners. Power in the Philippines is expensive. The only Power that is cheap is in politics and justice. Philippines is a cauldron of steam and geothermals. Filipinos have no brainpower to tap into this, if ever they have the brains the first and foremost on their mind is “WHAT IS IN IT FOR ME?” “HOW CAN I MILK THIS PROJECT?” “IS IT GOOT FOR ME?” They never thought about the inhabitants of the Republic. It is high time and the right time to outsource national power to competent foreigners. This is too hot to give it to mere Filipinos. Of course, the corrupts would go voodoo-like trance. To hell with politicians. Outsource now. I want cheap power. I want fast internet. I want Wi-Fi everywhere. Bring back ZTE. Ahahaha, I needed the break, too, although I must admit today’s hearings were a delight, tempers on edge and another Binay lie revealed about who REALLY owns the pig ranch and other agricultural lands there. We still have no idea who owns it, but the trail is getting hotter. I think for electricity outsourcing management or some similar solution is needed to give one entity executive authority on the huge mess that is now individual private interests, each out for themselves. No one is out for the nation. Now ZTE I’d have to ponder for a year or ten . . .
You’re right, it needs Edgar’s interpretive finesse and wit. The point Senator Pimental made after this exchange was that Tiu and the Binay camp had been claiming in the media that he owned the property, thus it did not belong to the Binays. This was proved to be another lie. It was about the only substantive point made during the whole rather boring meeting (thanks to Cayetano’s overkill). That, plus Mercado’s point that Binay owns some other undeclared assets. Senator Pimentel: In our eyes, Mister Tiu, you are not the owner right now. So why are you here, Mister Tiu? Why are you here??? Mr. Tiu: But… but you asked me to come here, sir! Are you out of your effing minds??? No its not funny. You are picking the statments that you like without putting context into it. Remember, Sen Pimentel told Tiu that during his (Tiu’s) interviews with the media that he was willing to appear even without a sub poena. So if he wanted to go to the senate even without an invite, it means he has something to say to prove that he was the owner of the property. That is where Sen Pimentel was coming from. – What are the sources of energy now and their relative contribution in terms of percentages? – What are the prospective sources and percentages by 2030 (and beyond)? – How much is government owned versus privately owned? – Why do we need the ERC? Couldn’t its function be performed by the consumer protection and regulatory body? 2. The first graph gives us an idea of the sources of energy now and in the future but not the relative percentages. 2.1. While the dependence on Renewable Energy (RE), mainly geothermal, shows a bump between 2018 – 2023, there is no corresponding reduction in fossil fuels (oil, natural gas and coal). Indeed there are increases and continued reliance on these 3 forms. This contradicts the claim of an “adaptable” climate-change strategy. Perhaps the claim is just an empty boast and not a real commitment. 2.2. 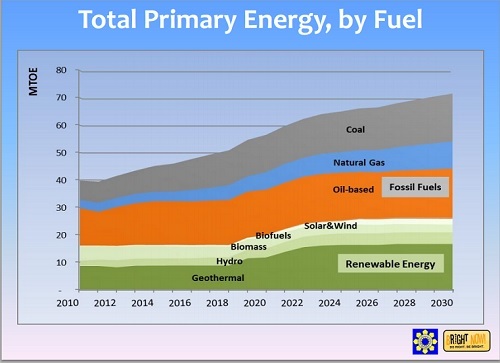 Solar and wind sources appear to be promising but no real growth is forecast until 2022. 3. Looking at the “Measurable Targets” for RE, wind is seen as a greater contributor than solar or ocean. It is conceded that wind turbines are more efficient than solar in large-scale applications, but for private homes – and for people who can afford it – perhaps solar is the way to go. 3.1. In a much typhoon-visited country, off-shore wind farms could tame strong winds. Perhaps we should have a defensive chain of turbines on the eastern seaboard that would domesticate the likes of Yolanda, Ondoy, Pablo and their kin. 3.2. The country is surrounded by ocean. The country should be doing research on this abundant resource. Students in science high schools and engineering colleges could be encouraged to think out and develop viable solutions. 3.3. I note that nuclear is not an option. In a country where there is no Tagalog term for “maintenance”, this is just as well. 4. One last thing, if one has not defined the problem, how can one devise a solution? Defining the problem is the first step in systems analysis. I think the statistics you seek might be there but it would be a nightmare to read through things to find them. Indeed, DOE acknowledges the Philippines will remain even MORE dependent on fossil fuels in future years. I thought the 2030 timeline was a reasonable planning period, but I just see slow sliding on the various energy sectors and I’d want some jumps, and investment to make those jumps occur. I think there is not enough dedicated effort given to any of the natural forms of energy. I once had a technical discussion with a student about 30 years ago who was trying to harness wave power, but never got to any decent efficiency. The ocean is a powerful beast and hard to tame. But you are right, it ought to be balls to the wall (an American expression, related to squash or handball or somesuch I imagine) on all these alternative fields. I think nuclear is an option if it can be sited right, considering the winds. Southeast Mindanao perhaps. But not in Bataan, right upwind from Manila. And 4.0 is EXACTLY the big issue. Neither DOE or ERC define the REAL problem, which is probably the structure and the laws and the conflicts of interest (or collusion) among private entities. I’d suggest they use the Japanese planning method of asking why five times, and maybe they’ll get close. Without an honest statement of the problem, it is impossible to see a solution. You’re right on the mark. Re # 3 – It baffles me that we’re in one of the sunniest countries in the world, and yet we’re not fully utilizing solar energy. I read in a blog sometime ago that some guy in Seattle (Seattle!) claims he was able to reduce his energy bills by 80% after installing solar panels. I think with our weather, someone who has solar panels might be able to go off the grid altogether. Maybe the DOE should be looking into making solar a more attractive investment for commercial establishments? If SM installed solar panels in all of its malls for example, I think it might make a difference in the looming power crisis this summer. That said, I was pleasantly surprised when I went to Puerto Princesa last summer and found that many are utilizing solar power over there. We went on the Underground River tour and we saw that the streetlamps were powered by wind and solar. Yes, I feel the same sense of loss about thermal. My small island could be like Arabian states, an exporter of electricity and very rich, but the opportunity is being squandered by politicians who are serving themselves and for sure are not thinking big. We are blessed with sunlight but we are unable to take advantage of, much less count, our blessings. In the Land Down Under, I have solar panels installed up on the roof and I get a rebate from our energy supplier in excess of our consumption. That’s right. Solar power not only completely covers our usage 100% but we are being paid for the excess electricity that we do not use and contribute back to the grid. We used to pay an average of $300/quarter, and now my “bill” shows a credit of about $100-$150/quarter. The local suppliers though may not offer the buy-back scheme as an incentive. But solar is expensive to install and I have calculated that the break-even period is 4-5 years. If the system last for 10-15 years, then it is worthwhile. Enjoying air-conditioning during summer, without worries, doubles the pleasure. @edgar – You mean after spending billions on a “green” “world-class” parking building, they didn’t even bother installing solar panels? Haha. @Joe – That’s the problem with our politicians, most of them are focused on the short-term and their home turfs, and not on the big picture. I see the same thing in the management of the transportation system in Metro Manila, in our mining policies… It’s a mess. Yes, Essie, I agree there is a lack of big picture viewing of things, and long term vision. Most here play small ball. Just wanted to tell you that I enjoy your posts, and so do the recipients of my mailing list. A lot of my friends, specially my classmates from De La Salle High School class ’64, (those alive anyway), have asked about who you are because they/we share a lot of your views. Keep them coming, and I will continue to do my share in disseminating your views to as wide a readership as possible. By the way, like you I live in the province (Palawan) and probably have a similar lifestyle as yours. Why thank you for the kind note, Joey, and for keeping the thinking going amongst your friends. Palawan is fantastic, so keep up the good life there . . . Fully agree on inadequate infrastructure that the national gov’t could have built. To the extent that project costs are denominated in Philippine peso there is no constraint in affordability. However when projects involved the hiring of foreign contractors and suppliers, the affordability question comes into play because those foreign contractors and suppliers will only agree to be paid in dollars. The national gov’t will either need to earn or borrow those dollars and stockpile its dollar reserves. When Marcos tried to build the Bataan Nuclear Power Plant, he financed the project mainly by borrowing dollars from IMF-World Bank so Westinghouse could get paid and he pocketed half of the borrowed money. That was the time when our dollar debt ballooned which gave rise to such militant organizations as Freedom from Debt Coalition and permanently etched (albeit erroneously) into the consciousness of Filipinos that we need to borrow in order to spend. Every road. every bridge, every airport, every power plant that needs to be built has to be financed from a loan from an international agency. I’d guess when all the overseas workers are taken into account, there are a lot of Filipinos hereabouts who are capable of organizing and executing a capable plan to build infrastructure projects if regulations and blockages and insane bureaucracies were taken out of the picture. Maybe one or two international MBO experts could be leveraged through multiplication down the org chart. Yes, IF the national gov’t could find the know-how or technical expertise to build those infra projects locally, there will be no constraint on how to finance it. No need to borrow dollars from a foreign bank or entity. No need to worry about depleting our dollar reserves. Being monetarily sovereign, the national gov’t does not even need to collect taxes to fund those projects. It could afford whatever is for sale in its own domestic unit of account. Nope, this is just wrong. The United States federal gov’t is also the sovereign issuer of its own currency. Taxes do not pay for military spending. When the federal gov’t pays its bills, it sends electronic instructions to the bank of the payee to credit its account by whatever amount is owed. The moment the bank obeys the instruction (as it always does – federal checks do not bounce), fresh money was injected into the federal banking system. That is not tax money. Nor did it came from China. Well, economic purity is not the point of the tweet blog which is ridicule of the notion that contracts have to be balanced in every respect. I get your point that the government can print money. I think most citizens don’t think in those terms and lots of luck at explaining it to them. Yes, some myths (creationism, for instance) are hard to dispel. People tend to cling to the notion especially if it’s being reinforced in some media sources.